Body language tells you what your dog is likely to do next. Guarding is a natural instinct for dogs. Guardian breeds, such as those bred to protect livestock like German shepherds, are particularly likely to exhibit this behavior, but all dogs have a protective streak. While it’s comforting to know he’s got your back, having your dog guard against other dogs can be a hassle. Observe his behavior and determine his tolerance thresholds. Some dogs may bark or growl at another dog as soon as they spot them, others may simply gaze at them before showing their teeth. The amount of time and distance your dog gives another before getting antsy with him determines his tolerance threshold. The tolerance threshold is different for all dogs. Some dogs may only guard when another dog comes close to you, others will snap into action if a dog so much as comes near the gate to the yard. It’s important to also figure out what he is guarding. Dogs may guard their toys, their food, people or all three. Make a note of the signs that precede guarding. For example, he may whine, prick up his ears or get straight down to the business of showing how tough he is. It’s important to know these signs so you can react promptly to discourage him. Establish a controlled training scene. Remove all distractions, such as food and turn off the television. Arrange for a friend to come over with her dog. Only use a dog who is passive and well socialized. Walk your dog around the training environment. This can be the yard, or in the house if his tolerance threshold is quite low. Give lots of verbal praise for as long as he is passive. Even if he hasn’t seen the other dog yet, reward his passive behavior. This teaches the dog that when he is passive, a good consequence occurs. Continue to give the praise and fuss him as the other dog comes into view. Monitor his body language. Remove the praise and fuss as soon as he switches to guarding mode. Use the leash to walk him away. Don’t try to command him to stop or shout at him. 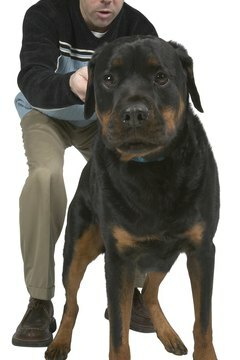 This change in your demeanor will make the dog think that you’re alarmed and will encourage him to guard you more. Repeat the exercise three more times. Walk him away again if he guards against the other dog. Reward him with a food treat, praise and fuss the moment he allows the dog to come beyond his original tolerance threshold. The tolerance threshold may be the gate or the door to the house. With sufficient repetition, your dog will learn that when passive in the presence of other dogs, he receives the positive stimuli of fuss and praise. But when he guards, those positive stimuli are removed. This is called negative punishment.